Safaricom Foundation, KCB Foundation, Media Owners Association of Kenya and Kenya RedCross Society have today launched a humanitarian initiative to assist the starving in Eastern, Northern Kenya and parts of Rift Valley. The initiative is christened Kenyans 4 Kenya Many other initiatives have been launched including the #FeedKe one by my great friend Ahmed Salims. I did my first serious online CSR through the Kenyan diaspora initiative in 2008 to help the Kenyans who were suffering after the 2007 General elections. Many lessons were drawn then. Key among them is that trust is very important. Any small dispute on the collections and distribution of funds will come back to haunt even the most innocent of volunteers. That is why I asked lots of questions before getting to participate in the Team British and main question was what the 5 sisters Ngendo had abroad could not raise a fee which anyone doing anything “abroad” should not find a problem with. It was pathetic that people think that you hate something when you ask questions. But up to now, the story has still not added up to me in many ways. #FeedKe is a great initiative. the problem is that the credibility an experience of those involved makes it a less attractive initiative. So however much you might want the Blue Chips like Safaricom, KCB, NMG, Standard and others to join an initiative run by one person, they simply wont. And even in CSRs, businessmen participate in what will elevate their credibility and market reach with little risks. It is very scary to expect Safaricom to call Ahmed and participate with him on the FeedKe while they might so staunchly support it. Safaricom and KCB have the muscle to achieve, in one day what Ahmed and the FeedKe group might achieve in a lifetime. Safaricom has a close to 20 Million client base who can easily be used to raise not less than Ksh 100 Million with just a click. KCB have the branch network and traffic through the same to do even better. And with all East African branches linked. Ksh 400 Million target looks like just a child’s play for the two. So sometimes you hope to get the involvement of the big international organisations and even media on this and they wont want to associate with an unknown group run by individuals. They would rather go with the Safaricoms and KCBs of the target areas. This is why we must have both initiatives run side by side. There are also individuals who would love to participate where they would get noticed. They would want a situation where their donation or involvement might get the best acknowledgement. 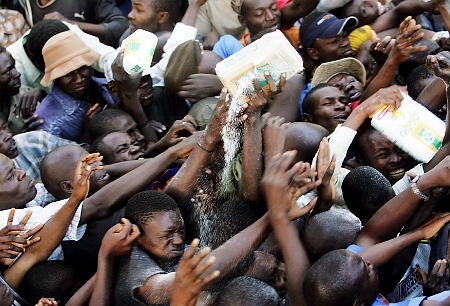 Kenyans4Kenya might not be the best for such an individual but FeedKe might be the best. So just get down and donate. Dont engage in actions which will not save any of the starving. This is not an application development competition. This is a competition to save lives. We MUST SAVE lives. One motivational speaker at the ongoing Kenya Primary Schools Heads Association mete in Mombasa told me that the chant is YES WE MUST. So get down and donate to the initiative you support but to anyone with a sense which is common, Kenyans for Kenya looks attractive in many ways. Donations can be sent to the M-PESA PayBill number 111111 at no charge as this has been waived. Donations can also be sent to account number 11 33 33 33 38 at KCB. Kenya Red Cross Society cash tins will also be available in 169 KCB branches countrywide for receiving donations. Money raised through the KENYANS for KENYA campaign is expected to be used to finance a raft of short and medium term interventions meant to alleviate the suffering of the most vulnerable groups and eventually underpin food security in the long term. Short-term interventions include buying Unimix, a nutritious pre-cooked meal for school feeding programs and at health centers and other locations which will target the vulnerable like the aged and mothers. The money will also be used to buy and transport water from existing water sources. A ton of Unimix costs Ksh 105,000 and can feed 100 children for 4 to 5 months, whereas trucking of 15,000 litres of water within a distance of 100 kilometers will cost Sh25, 000. Medium-term interventions will entail ensuring access by over 250,000 persons, to safe and clean drinking water through rehabilitation or sinking of boreholes and construction of green-houses in schools and areas where there is access to water via drip irrigation. Kenya is currently in the throes of its worst drought in six decades, according to UN agencies and the Government. Some 3.5 million Kenyans, mainly in northern Kenya are staring at imminent starvation and death. The situation has been exacerbated by runaway inflation, a poor maize crop for the current season and a ballooning refugee crisis in ever unstable Somalia, Kenya’s northern neighbor. Counties affected most include Turkana, Marsabit, Wajir and Mandera. 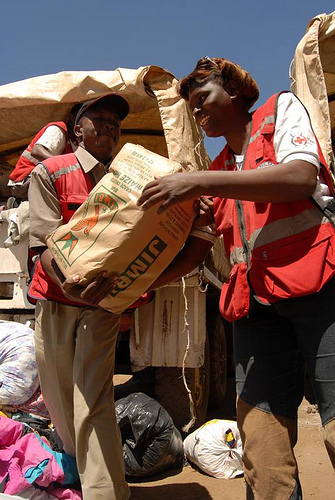 The Kenya Red Cross Society (KRCS) first launched a famine relief appeal in January this year, but only 20 per cent of the funds targeted was raised. All morning I’ve asked for a sound explanation as to why #Kenyans4Kenya,and this may well be it. Well in! Thanks for explaining how it really works with CSR. That being said,I must ask,is there a place for the individual who wants to help out? Should we always be prepared to have the big boys swoop in and bring forth the ‘appealing approach’? #Kenyans4Kenya could’ve adopted #feedKE and brushed it up given the pull its backers have.